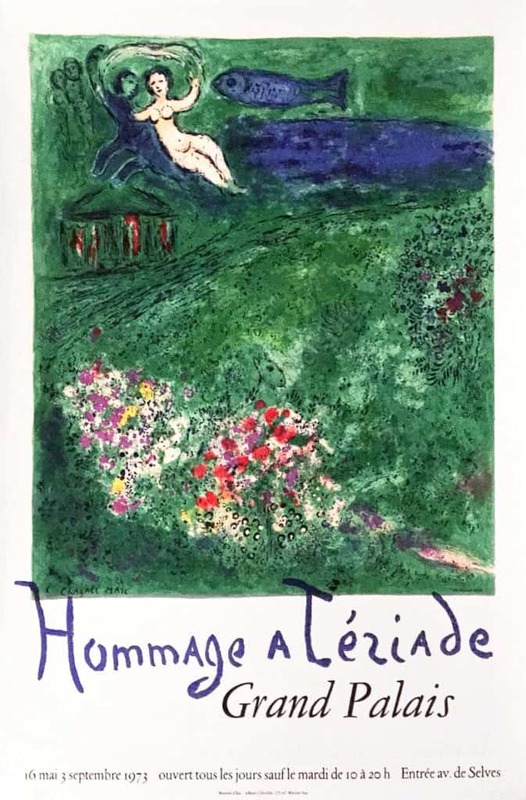 This is a French Mourlot exhibition poster for a Marc Chagall exhibition at the Grand Palais des Champs-Élysées in Paris, which took place from the 16th of May to the third of September 1973. Marc Chagall was one of the most influential modernist painters of the twentieth century, noted for his wholly original amalgamation of modern styles, and above all, his gorgeous and richly symbolic use of color. As Picasso once said, “When Matisse dies, Chagall will be the only painter left who understands what colour really is.” The poster is in many ways a classical example of Chagall's aesthetic, exemplifying the remarkable ways that he drew from the traditions of cubism, symbolism and fauvism to create vibrantly dynamic and wholly modern form of surrealist-flavored representation. The central image of the poster is almost entirely dominated by rich shades of verdant green that both constructs and frames several smaller scenes. At the top, a Reubenseque naked woman appears to be swimming on top of a lake, while dimly outline figures look on, and a fish appears to fly above; the lake and the fish is depicted in a fantastically blue. Below this scene is a house, at some distance it appears, outlined in wavy blacks and splotchy reds. The lower half of the piece is the most dominated by the lush greens that Chagall employs, interrupted only by his depiction of a series of flower beds in bold dabs of red, blue, and violet. This remarkable surrealist scene uses dream-like figuration, undulating and dynamic lines of lush color to create a beautifully dream like painting. Below, in a elegantly simple font that does nothing to distract the viewer's eye from the image above, the poster lists the information of the exhibition. The poster was printed by Mourlot, 1973.